Extended Submission Deadline Feb. 25, 2017. 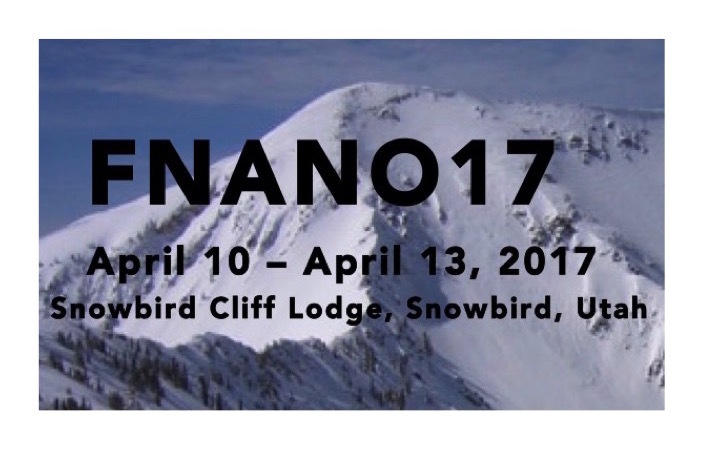 FNANO Conference Overview: This is a yearly conference on the foundations of nanoscience, maintaining the highest scientific standards and providing many opportunities for discussion and informal exchange of information and questions. Key topics include experimental and theoretical studies of self-assembled architectures and devices, at scales ranging from nano-scale to meso-scale. Self-assembly is a central but not exclusive theme: the conference covers a broad range of research into synthetic and natural nanoscale structures, devices and systems. FNANO spans many traditional disciplines including chemistry, biochemistry, physics, computer science, mathematics, and engineering. Information on the prior 11 years’ Conferences on Foundations of Nanoscience can be viewed at the archive web site (FNANO04, FNANO05, FNANO06, FNANO07, FNANO08, FNANO09, FNANO10, FNANO11, FNANO12, FNANO13, FNANO14, FNANO15 and FNANO16). This year’s 14th Conference on Foundations of Nanoscience ( FNANO17 ) will have a mixture of invited talks by distinguished nanoscientists as well as contributed posters and open discussion periods to enhance attendee interaction with the goal of creating vibrant intellectual community in the areas of nanoscience and self-assembly. We often include a special track on a topic of emerging interest to the nanoscience community. SUBMISSIONS: All authors wishing to present a talk (including a keynote or invited talk) or poster should submit an abstract of 1-2 pages in PDF format. Submission website will be open Jan 10, 2017. Registration website will be open Jan 15, 2017. Early Registration Deadline: March 15, 2017. CONFERENCE VENUE: Snowbird Cliff Lodge, Snowbird, Utah. FNANO15 Program Committee: Track Chairs: Descriptions of the program Tracks are provided on the Organization and Program Tracks website.